Director: Bob Bralver / Writers: Russell V. Manzatt & Michael W. Leighton / Cast: Pamela Ludwig, Dean Hamilton, Roy Thinnes, Don Grant, Courtney Gebhart, John Donovan, Todd Eric Andrews, Laura Burkett, Toni Lee, Dominick Brascia, Kathleen Kinmont, Gregg Allman. You won’t be rushing to recommend this relatively bloodless hashing of the slasher and detective genres, made for the teen audience, which features a campus Scream-like killer who brings purification to young ladies who pose for naughty photographs to pay their college costs. Pamela Ludwig is a student reporter piecing together the mystery, and Kathleen Kinmont has a minimal role as the first victim. 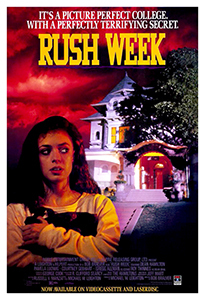 Unfortunately, Rush Week takes things too slowly and never really escapes its own pitfalls long enough to build adequate amounts of tension and when the action finally does kick in it’s too little too late. Still, it should keep you guessing for at least a few minutes (despite wasting the opportunity for quite a good twist that would make it even more like Scream) even if the box makes it sound ten times more interesting than it really is. Blurbs-of-interest: Kathleen Kinmont was in Halloween 4; Dominick Brascia was Joey in Friday the 13th Part V and also directed Evil Laugh.